The Panametrics-NDT™ Series 35 ultrasonic precision thickness gages provide easy-to-use and cost-effective solutions in applications where the opposite side of the test material is difficult or impossible to reach. These rugged, pocket-sized gages make stable, repeatable thickness measurements on most materials of varied shapes and sizes. 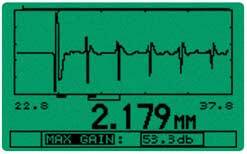 Accurate thickness measurements are displayed in large numerals on the backlit LCD or can be viewed along with the live waveform in the optional A-scan Mode. The 35 and 35DL can use transducers ranging from 2.25 to 30 MHz, which means that these versatile gages can solve the majority of thickness gaging applications, from very thin to very thick. In general, transducers with higher frequencies and smaller diameters allow measurements of thinner or curved parts and enhance the accuracy of the measurement. resolution up to 0.001 mm or 0.0001"
With a very low ultrasonic frequency bandwidth and a special pulser-receiver, the HP gages are specifically designed to optimize ultrasound penetration when measuring thick, highly sound attenuating or sound scattering materials. Typically these materials cannot be measured with most other ultrasonic thickness gages. resolution of 0.01 mm or 0.001" of 0.01 mm or 0.001"
The 35HP gages are excellent tools to measure fiberglass or composite parts, from aerospace structures to boat hulls and storage tanks that require thickness control. For more than three decades, Panametrics-NDT thickness gage engineers have developed the HP (High Penetration) series specifically for very sound-attenuating or thick materials. Not only can these gages use transducers as low as 0.5 MHz but their electronics (pulser-receiver) are highly optimized to process signals at these low frequencies. The result is that the Panametrics-NDT gages have earned a reputation for superior performance in measuring thick rubber, fiberglass, composites, and other tough materials. With reduction rate you can measure critical thickness metal thinning caused by bending. Differential Mode and Reduction Rate Mode are standard features on all models. Differential Mode shows the thickness variation from a pre-set thickness value. Reduction Rate calculates and displays the percent of thickness reduction after a material thinning process. A typical application is automotive sheet steel that is bent and formed to make car body panels. Velocity measurement mode with direct Velocity readout. All 35 models have the capability to make material sound velocity measurements. This standard feature is useful in applications where the speed of the sound within the material can be correlated to other properties. Typical applications include cast metals to monitor the degree of nodularity, and composites/fiberglass to monitor variations in density. Olympus NDT offers a digital caliper for automatic transfer of measurement thickness. 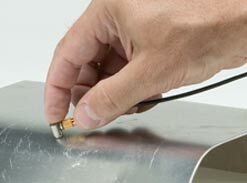 Application Auto-Recall simplifies making thickness measurements. Select any of the stored transducers and the 35 gages recall all relevant internal transducer parameters. Standard setups include most commonly used transducers. Just in case your special application problem cannot be solved with a Standard Setup, these gages can create, store, and recall as many as 20 Custom Setups (10 with the 35 and 35HP). Thickness and waveform of a very thin (0.004 inch or 0.10 mm) sheet of steel. Micrometers won't work in this classic application. Instead, the Model 35 with a M208 transducer makes a thickness measurement up to a calibrated accuracy of 0.001 mm (or 0.0001 inch) without breaking the glass. 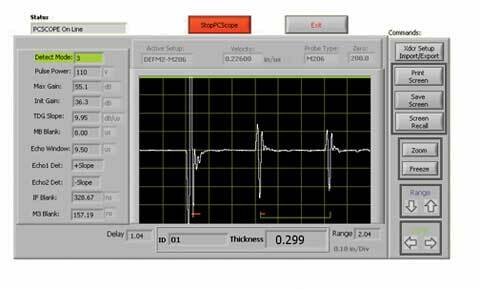 Optional 35PCSCOPE interface software permits the instant display of live ultrasonic waveforms and thickness readings directly on your computer screen. This is helpful when setup parameters require closer examination. An optional Live Waveform Mode on all models permits the user to view the ultrasound waveform (or A-scan) directly on the gage's display to make sure the thickness reading is correct. The Adjust Mode feature facilitates transducer setup adjustments to maximize measurement performance for challenging applications. 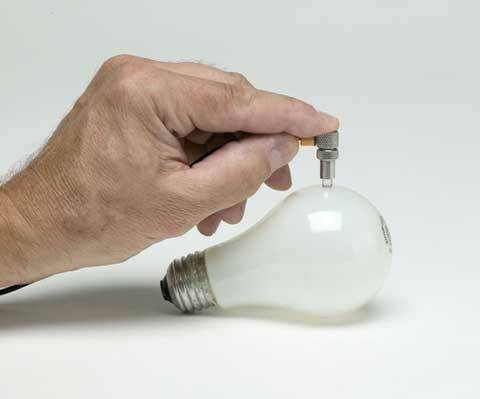 Ultrasonic measurements are accurate, reliable, and repeatable. Instant digital readings can be achieved by transmitting sound into just one side of a material, making it unnecessary to cut or destroy parts where the opposite side is difficult to reach and where micrometers or other inspection tools cannot do the job. Mode 1: Time interval between excitation pulse and first back wall echo, using contact transducers. Mode 2: Time interval between the first interface echo after the excitation pulse and the first backwall echo, using delay line or immersion transducers. Mode 3: Time interval between successive back wall echoes following the first interface echo after the excitation pulse, using delay line and immersion transducers. *Thickness range depends on model, material, transducer, surface condition, and setup selected. Min/Max Mode: Displays current thickness, minimum or maximum thickness depending on setting. Display Hold/Blank: Displays blanks after last reading or holds reading. 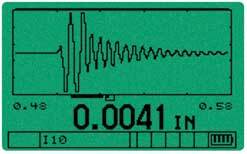 Differential Mode: Displays thickness difference between actual measurement and reference value. 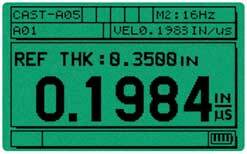 Reduction Rate Mode: Displays thickness and percent difference between actual measurement and reference value. Application Auto-Recall: Automatically adjusts internal parameters for various default and custom transducer setups. Low Battery Indicator: Continuously indicates battery status. Splash-proof, impact-resistant case. Sealed, color-coded keypad with tactile and audible feedback. Custom Language Utility: Allows translation of display text in many languages. Data Logger: The 35DL & 35DL-HP identify, store, recall, clear, and transmit thickness readings and transducer setup information via the USB port or optional RS-232. 4 File Templates: Incremental, Sequential and 2D Grid. Manual files from PC.